The capital of Gaddi culture is the town of Bharmour which lies in the valley between the Dhauladar and Pir-Panjal ranges in the state of Himachal Pradesh. This area, also called Gadheran, is tangled with jagged mountain ridges, gorge-like valleys, thunderous rivers and icy lakes, and is identified by all Gaddis as their ancestral home. 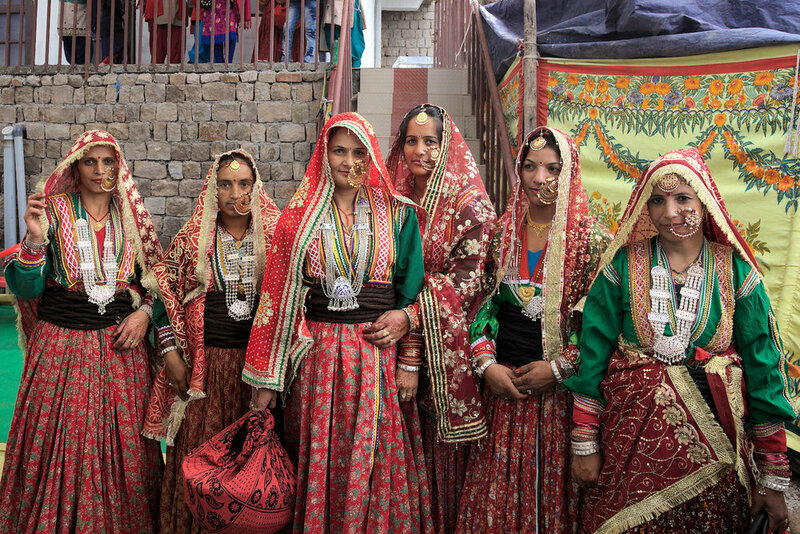 The Gaddi’s distinctive dialect, physical appearance, dress and customs indicate a differing ethnicity from others in this area of India. Where they originated from is uncertain, although pointing to temple inscriptions, Gaddi academics maintain they have been in the area since 7th century CE. It takes several weeks to make a dora. First of all, a handful of thin ropes are produced by rolling, thickly-spun wool together, between the palms. These are wrapped around the thin stem of a corn plant, forming one piece, which is again rolled together by hand. Then, for several days, the rope is soaked in water, and vigorously trampled on, barefoot. To finish, it is repeatedly rubbed between the palms, producing a strong, dark rope. The variety of sheep mainly herded by the Gaddis provides fairly coarse wool, which, in an effort to soften, is first washed several times. Gaddi men and women then spend long hours, in front of the fire, spinning the raw wool into yarn for the doras, gardus and other woolen clothes. A gardu, usually made by Gaddi women in the winter months, is woven in two pieces which are stitched together to form the large blanket. A key accessory in wedding ceremonies, they must be made months, or even years, in advance. In death, they also have important functions: the dead body is cremated in one, and during the mourning period that follows, the male relatives spend ten days sitting on another. To cope with their geographically harsh homeland, the Gaddis have developed a unique set of handicrafts. These are crucial to both their shepherding profession and belief system, and therefore are still produced and used today. In making these, however, the Gaddis have relied on a steady supply of sheep-wool from their shepherding friends and relatives. In modern times, the young are increasingly looking for less physically onerous, and indeed safer, occupations, leading to a decline in the number of shepherds. The resulting reduction in the availability of sheep-wool may leave the future of these unique products in doubt. Saying that, the Gaddis’ fierce pride in their culture and the ceremonial importance given to items such as the dora and gardu, may ensure their survival in this changing world. One legend tells that when they arrived in Gadheran, they prayed to Shiva to help them as they could see no way of making a living in this inhospitable environment. Shiva, it is said, listened and gifted them the dora. From this, the Gaddis realised that shepherding sheep and goats was not just their vocation, but their dharma (duty). Over the centuries, sheep wool has traditionally been used to create handicrafts which are not just of functional use, but also have important ceremonial purposes. The dora, believed to be unique to this Himalayan group, can measure up to 60 metres and weigh around 2 kilograms. In the past shepherds wrapped the dora around their knee-length cholas (white, woolen coats), creating space inside the breast area of the coat. In these pouches they placed possessions, or baby goats, while on the move in the mountains. 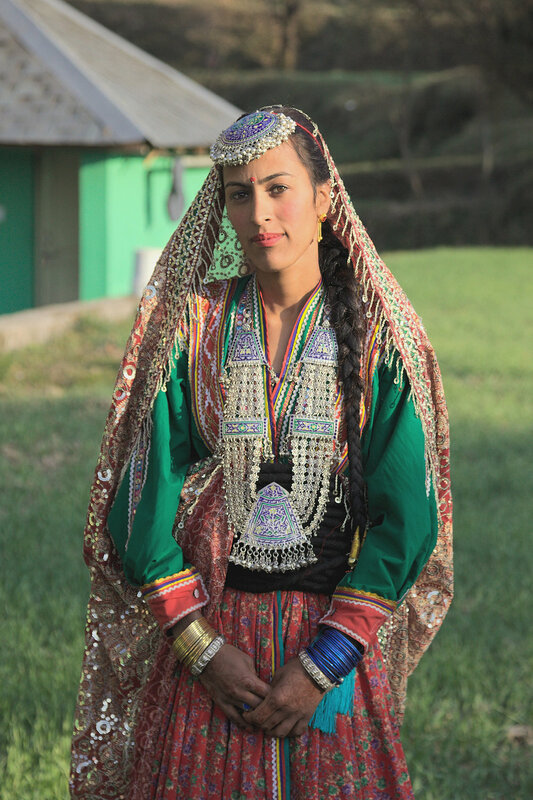 Although still worn daily by some elderly Gaddis in remote villages, today, the dora is mainly worn, by both men and women, for religious or special occasions. When in the mountains, shepherds are now wearing simple, woolen jackets and Himachali caps, rather than the chola and topi (a cone-shaped hat, said to represent the peak of Manimahesh Kailash, the home of Lord Shiva). They do however, still head off armed with several gardus, a checked, sheep-wool blanket, to keep them warm at night. Follow Eileen’s Travels here and here.